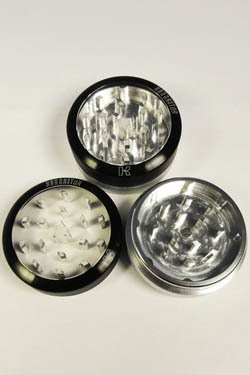 This is the 2-piece 2.2" Kannastör Glass Top Aluminum Grinder. It features a strong magnetic seal and a glass top for easy and accurate grinding. All Kannastor grinders feature unique drop through holes to prevent over-grinding, and specially designed blades for effortless shredding. The 2.2" Kannastör Glass Top Aluminum Grinder comes with a stuff sack to keep it shiny, clean, and scratch-free.